Cosmos. 2002. Limestone, height 220 cm. The desire to crown with a person-oriented (ethical) beginning the aesthetically significant space of the piece of art became strong after the creation of the compositions «MYSTERY», «PIETA», and the «Duet, M. Voskresenskiy and A. Knyazev». 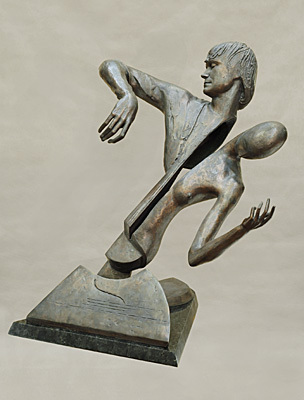 Such experience had been accumulated earlier than the idea became ripe of the need for the presence of the hierarchically supreme, the one that determines the structure of the person-oriented beginning in the piece of art («Pieta», 1990, chamotte, the «Concert by S. Rikhter», 1979, bronze, granite). Intuition evidently outruns thought. To understand intuition in every subsequent work means to understand the perspective of one’s creative manner. In the compositions «Concert by A. Knyazev» (bronze, granite, 2002 – 2004) and «Duet, M. Voskresenskiy and A. Knyazev» the person-oriented beginning proves itself as the state of meditation in the musical creativeness of the portraited. The depth of the images depends here upon the artistic merits of the works, upon the plastic expressiveness of the portraits, upon the spatial and rhythmical quality of the compositions, and upon their correspondence to the theme. A concentrated purposefulness of the spiritual vision which acquired maturity in the tests of life (with life) that was approaching its finish, a more energetic purposefulness than it was during the young years – this is how I see V. S. Solovyov in one of his late photographs (may be in his last photograph). It prompted to me a new version for the rendering of the bust monument to the poet-thinker (2003). After completing the compositions «MYSTERY» and «PIETA» I felt the possibility of the synthesis of the plastic ideas of those works. This is how the «Cosmos» and «Infinity» appeared. 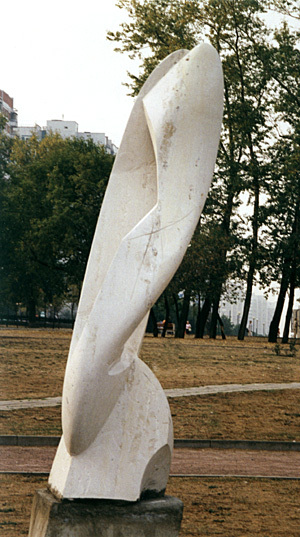 The «Cosmos» (limestone, 220 cm) is the contrast of the static shell-cocoon and the plastic of an anthropomorphous figure in the process of detaching itself. The piece was created during a symposium in Moscow in 2002. The work at the experimental version of the «Infinity» (granite, h – 3.4 m) continues at Gerlesborg, Sweden. In these works I had to sacrifice the person-oriented beginning for the sake of the spatial logic of the composition. This is pure expansion into cosmos, archetypical intuition, barely manifested plastic of human figure in the nearly literal expression of the idea of «ascending curvature of space» (the precedents being provided by the «Steps», 1978, the «Ascension», 1980, and other works). In the strict sense of the word, the person-oriented beginning is possible in a work of art only if portrait material is included. Rhythmical repetition of the forms and contrast thereof, taken as an artistic phenomenon, are studied with a closer attention than before, the same being true of the nature drawings with the premonition of going out into the sculptural composition while preserving all the richness of unexpected combinations and aspects. The person-oriented beginning has found for itself expression in the portrait of N. A. Alexeyev, the mayor of the city of Moscow in 1886-1893 (bronze, granite, h – 55 cm, 2004), performed for the contest design of the monument in Moscow. I continue to write down my thoughts in the hope of realizing better my intuitions and making them more mature. Best my projects inevitably go through an Utopian stage. Utopian traces remain to stay in the final versions. The process during which the composition enters irreality (independently of my will) and emerges from irreallity (not always so) takes up the totality of my life’s creative forces. I am motivated by the desire to express in space the main feeling of my soul, its curve and its tune, the two forming between them the prism through which I watch the subject of my work. This vision draws me close to the theme and makes it personal. It seems to me sometimes that my projects are forms of slumber, reverie, retreat from reality. True, some of them find material embodiment, but quite often this is merely invasion into the world of things by the zone of slumber and fantasy, for which invasion one has to pay.